Just for a change, I visited this particular out-of-London district two days running - on Saturday for the Weather, and on Sunday for the Event. The park lies on the banks of the River Mole, technically in Hersham but considerably closer to Cobham. Access is over a modern bridge to a modern visitors' block, where your admission money will be taken, but after that everything's proper retro. Best buy a 40p map to guide you round the full 2½ mile trail else you'll likely miss something, there being a heck of a lot of surprises hidden around the site. An early climb leads to a splendid viewpoint across a tumbling vineyard, where the 'ruined abbey' by the lakeside turns out (on closer inspection) to be plastered brick. A series of ornamental islands follows, connected by a series of bridges which on Saturday were proving the perfect backdrop for a Chinese couple's wedding book. Time your visit right and you can enter the Crystal Grotto, an astonishing space. If the stalactites look somehow artificial that's because they're made from hundreds of thousands of crystals stuck on by hand, once in the 18th century and again during a more recent restoration. And although it feels like you're underground the reality is very different - this is an artificial building crusted with oolitic limestone, and with a very functional pumphouse cunningly shielded around the back. The Gothic Temple on the hill frames a fine panorama across the central lake, but for the finest view of all head to the opposite end, beside the replica Turkish Tent. It's easy to imagine Hamilton's guests taking a sharp intake of breath after emerging from the upper lawns to see the land drop away across a vista of blue and green. That enormous evergreen is The Great Cedar, at 120 feet tall reputedly the largest in Europe, because it helps having been planted over 250 years ago. Elsewhere in the backwoods you'll find a huge waterwheel used to power the garden's water features, a Gothic Tower tall enough to poke above the highest treetops (alas closed at present, so Canary Wharf went unseen), and a replica Hermitage, all with an unrelentingly bucolic air. 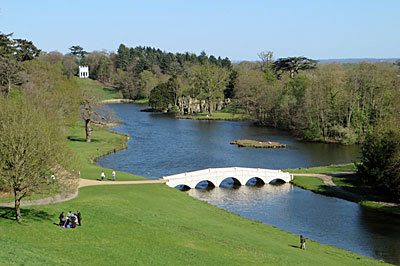 I imagine the park changes dramatically with the seasons, hence the attractive offer of an annual pass for more local visitors, but even as a one-off, on a fine day Painshill is quite something. The world's first purpose-built motor racing circuit was built in Surrey in 1907, in nine months flat, on riverside meadows to the south of Weybridge. Local landowner Hugh Locke King was a big fan of the newfangled automobile, and wanted to create somewhere off-road that vehicles could be raced legally. His circuit was almost three miles in length, surfaced in concrete rather than tarmacadam, and with steep banked curves for a more thrilling ride. Think of the opening minutes of Chitty Chitty Bang Bang, and you'll not go far wrong. Motorsport paused during World War I when the War Office requisitioned Brooklands as a military airfield, building on a brief history as a pioneering civil aeronautical centre. After the war motor racing returned with a vengeance, with the first British Grand Prix taking place here in 1926, and the top drivers battling repeatedly to break the course record. By the 1930s Brooklands was one of the great attractions of the day, with enormous crowds coming to watch the races, and to see and be seen by society. Think of the opening half minute of A-Ha's Take on Me and you won't go far wrong. World War 2 put a stop to the racing programme, with the site turned over to the production of Hurricanes and Wellington bombers (plus the development of the bouncing bomb by local scientist Barnes Wallis). So damaged was the racetrack by wartime operations that it never reopened, the site instead taken over by the Vickers aircraft company who churned out Viscounts, Vanguards and VC10s. Brooklands' history is phenomenal, indeed formative in so many ways, and can't be done justice in a single paragraph. So thank heavens there's a museum to tell the story properly. It opened around 35 years ago in the northeast corner of the site and has steadily grown in content ever since. The Brooklands Museum is open every day, with admission currently pegged at £11, and I'm trying very had to work out why I've never been before. Many of the original buildings from along the Finishing Straight survive, including the domed Clubhouse where officials oversaw proceedings and the sheds where Malcolm Campbell tweaked his cars. One long workshop tells the Grand Prix story, with example vehicles from Brooklands' era and since, plus a McLaren simulator you can hop inside and pretend to drive. Motorbikes get their own separate section, as do bicycles whose history is well told down one long gallery, despite them never have been manufactured here. One flying car with picnic basket will be very familiar, although whether it's the actual Chitty from the film or a damned good replica I couldn't say. One out-of-the-way feature is Test Hill, a steep track (1:4 in part) down which engineers trialled brake systems and up which drivers attempted to break unofficial speed records. And along the edge of the site a lengthy fraction of the concrete racetrack remains, along which it's possible to wander, although management would rather you didn't hike up to the very top of the bank for health and safety reasons. A separate section of the Museum covers aviation. One part's in a very large hangar, where you'll find a Wellington dredged up from the bottom of Loch Ness, and various other planes and plane bits, including the full story of the original bouncing bomb development. More obvious however are the large planes scattered across the outfield, including several locally-produced Vickers, one or two of which you might be able to enter. But the queen of the display has to be Concorde, this the initial British production model G-BBDG, with many of its parts having been assembled on site. I didn't take the chance (for a pre-booked fiver) to climb the ramp and go aboard as part of the Concorde Experience, nor fork out considerably more to sit in the original Concorde simulator. But I loved the opportunity to walk right up close and underneath to observe all sides, with free exterior access, because I'm always in awe if I meet her. It's just that nobody else seemed to be especially impressed... because they were all here for the buses. 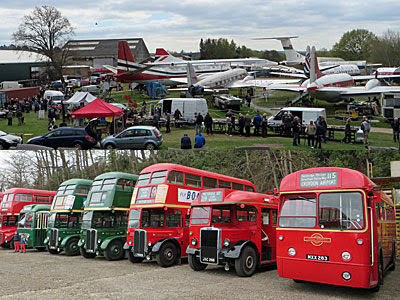 The London Bus Museum is based at Brooklands, despite not actually being in London. Their collection of three dozen vehicles is housed in a long hangar, artfully displayed to tell the story of the capital's buses from horse-drawn to post-war. What's refreshing is the amount of detailed background, fully illustrated, around the walls, without which this might be a somewhat lightweight tour. It's also good to see a variety of older buses, not just the usual suspects, in context and lovingly preserved. 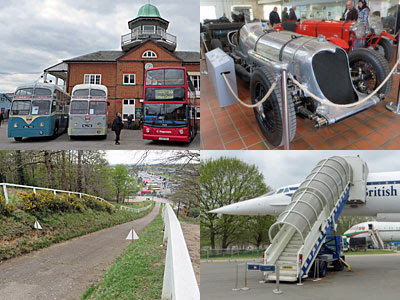 Admission is free along with entry to Brooklands, so you get the cars, bikes, planes and buses all thrown in. And some weekends each year the LBM throws a big additional bus-related shindig to make for a proper special day out, this Sunday's being the 'Spring Gathering'. A hundred or so vintage vehicles turned up, not just ex-London but from all over the country. Oxford, Ipswich and Huddersfield were represented, amongst others, along with a fair smattering from London Transport's Home Counties services. I remembered some of these London Country stalwarts from passing my front door in the 60s, and of course recognised the so-called New Routemaster that passes it today. The mass assemblage had attracted hordes of Men Who Like Buses, very much their own demographic sub-genre, generally of post-retirement age but occasionally in keen teenage clusters. They thronged the car parks with their cameras, willing malingerers to get out of bloody shot, pausing only to discuss with friends or family all the particular details of each vehicle. Of Concorde, alas, they had little to say. This being a major bus event a number of hangers-on had turned up to try to flog stuff. They laid out their wares on dozens of stalls, both indoors and out, creating an extensive marketplace of four-wheeled ephemera. Photographs are always good sellers, as are books and die-cast models, while others plump for decades-old timetables now changing hands for pounds rather than pence. It made for a buzzing atmosphere across the site, I'd guess far busier than on a bog-standard Brooklands day, not least because of the number of vehicles on the move. Various buses were commandeered to run special services out into Surrey proper, the most popular being the shuttle link to Weybridge station. I'd arrived on RM2760, the last Routemaster ever built, but my journey back at the end of the day turned out to be more unexpectedly special. 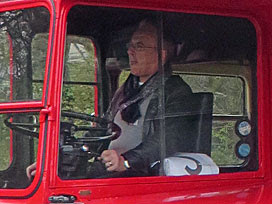 I don't think any other passenger clocked the identity of the man behind the wheel of RTW 467 but I did - TfL's Commissioner Sir Peter Hendy CBE. He manoeuvred the juddering vehicle out into the modern commercial park the rest of Brooklands has become, rounded the perimeter of the Mercedes Benz test track, and delivered us adeptly to the station ten minutes later. He may be paid a king's salary, but I for one am reassured to know that the man at the top of TfL still volunteers as a bus driver on special weekends. Nextdoor: Mercedes-Benz World - for I suspect an entirely different demographic, for whom modern cars and consumption are the thing, this sleek branded attraction with product display and test drive opportunities offers wallet-emptying exhilaration.